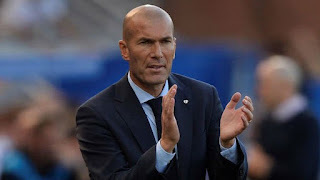 Real Madrid manager, Zinedine Zidane has reacted to the 3-0 defeat his side suffered in the hand of Barcelona on Saturday. The Frenchman accepted responsibility for the El Clasico defeat that left the European champions 14 points adrift of Barcelona. The former Real Madrid player, however, insisted his side will come back stronger in the new year after La Liga’s winter break and refused to concede the league to Barca. He told post match press conference, “We are down because it is a defeat that hurts. Zidane made some surprise changes in the squad, starting Mateo Kovacic for the first time in La Liga this season. However, his plans failed as Real Madrid missed a host of first-half chances and Kovacic was powerless to stop Messi wrestling control of the game. Messi netted from the penalty spot after Luis Suarez’s opener and then teed up Aleix Vidal for Barca’s third in stoppage time. Zidane added, “Tomorrow they are going to hammer me, that is football but it won’t change how I think or what I do. “I am the coach and I will continue like this as long as I am here. “The first goal comes from an error by us and the sending- off completely changes the complexion of the game.